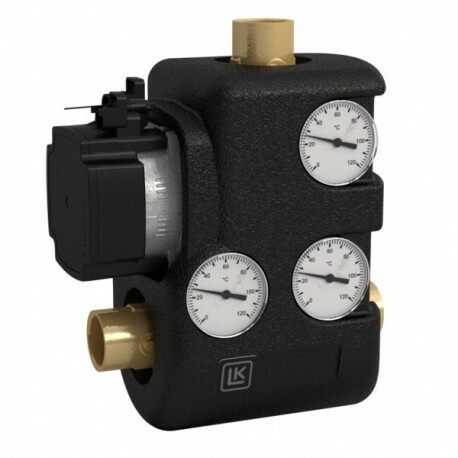 Loading Unit LK 810 ThermoMat 2.0 G is a loading unit for heating applications with solid fuel boilers and storage tanks. The loading unit is intended to ensure a high return temperature as well as an optimal temperature stratification in the storage tank, thus increasing the efficiency of the system. Tarring and condensation are prevented which prolongs boiler life. The Loading Unit LK 810 ThermoMat 2.0 G is a compact design with an integrated low-energy circulating pump, that fulfills the requirements of ErP 2015, and a thermic loading valve that regulates on two ports. The loading unit has three ball valves to simplify installation and maintenance, three thermometers that allow for simple control of the loading process and an insulation to minimize heat loss. The loading unit is available in two versions - with or without check valve. With a check valve the functions described under phase 4 will be obtained. to the right or left of the boiler.